A report on the status of fire services in Oshawa, commissioned by the city’s professional fire fighters association, and written by the International Association of Fire Fighters, has called for more staff and vehicles to increase coverage and response times, namely in the downtown core. A sprawling report by the International Association of Fire Fighters claims the city is falling short of standards in several areas. The report, released earlier this month, was commissioned by the Oshawa Professional Firefighters Association, also known as IAFF Local 465. It includes a lengthy list of findings and recommendations. The IAFF states that Oshawa Fire Service is able to respond with a suppression apparatus to 66.7 per cent of roads in the city within four minutes. In comparison, the National Fire Protection Association (NFPA) standards state services should be able to respond within four minutes 90 per cent of the time, and the OFS response time was six minutes nine out of 10 times. While Dyson acknowledged this would “take some time” and come with a cost, he believes it is needed. Dyson says the report states the OFS move to meet NFPA standards for medium and large-hazard fires as well, but believes the work needs to begin with the most pressing issues. “Look at the low-density fires and let’s get that one right,” he says. The report also calls on the city to “address deficiencies in response capabilities in the areas of Oshawa most susceptible to the possibility of future emergency incidents” and routinely perform risk and hazard assessments. The union has been critical of city decisions in the past five years, including moving personnel and vehicles from Station 1, the city’s downtown station, to Stations 3 and 6. Dyson says these decisions and others have created a gap into the downtown core. The association says this area is the most “high risk” in the city, with the highest call volume, along with a significant number of older buildings, and more low-income and senior residents. For Dyson, things came to a head with a fatal fire on Centre Street in January of this year that claimed the lives of four people, including two children. “My members are continuing to deal with the aftermath as the community and families involved are,” he adds. 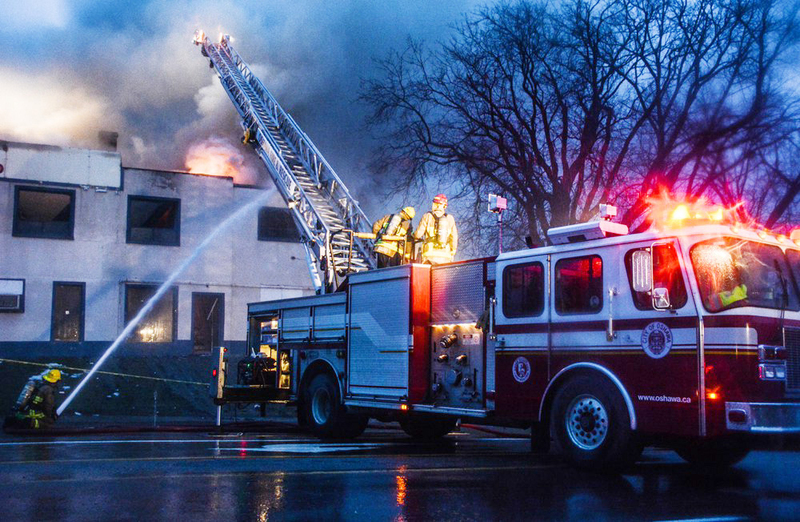 Soon after that incident, the local association began working with the IAFF to create an updated community risk assessment that would look at the effectiveness of the city’s fire resources and how they are deployed at the city’s six fire halls. Oshawa Fire Chief Derrick Clark presented his five-year review of the city’s Fire Master Plan, created in 2013, earlier this year. After concerns were raised by the union, city staff came to council with a recommendation to have the consulting firefighters behind the fire master plan peer-review the document, and also create a community risk assessment similar to what the association was planning. However, council later turned down this plan. “I think the simple answer to that is, Dillon did the first master fire plan, and it’s the responsibility of the fire chief to do the five year review. It’s not the responsibility of the association or the member firefighters to do a review of the master fire plan. That document was approved by council and is a guiding principle for the City of Oshawa,” Clark said. Dyson says he is “disappointed” the report wasn’t available before the current council’s final meeting, but states they’ve made it readily available to councillors, city staff and senior OFS management. “To date we’ve heard nothing. We’ve asked to meet with the city to discuss the report, and the response has been ‘we’ll meet when we’re ready’,” he says. Oshawa Fire Chief Derrick Clark said it would take some time for him to review the report thoroughly. Dyson also states the report is “not a matter of laying blame” on any one party. “There is an opportunity for us all to work together to improve the response capabilities,” he says. Dyson points out that the report the IAFF finalized was using the city’s own data between 2015 and 2018, which the association was required to use Freedom of Information requests to obtain. “We’re measuring it against industry standards, and we letting the science and data speak. These shortfalls are creating unnecessary risk…we’re calling on the city to heed this report, and look at it’s findings,” he says. Mayor John Henry contended that the report has only been out for a short time, and he believes discussions will be had. “It’s topic of conversation for the new council going forward,” he said. In regards to Oshawa not meeting the NPFA standards, Henry says it is unlikely that Oshawa is the only community facing this issue, and he would be surprised if any municipality met those standards with the exception of the City of Toronto. Henry said Oshawa has the largest fire service in Durham Region, running eight trucks, and that was determined in the Fire Master Plan in 2013. To him, he supported having Dillon review the fire chief’s five-year review, but it was defeated. He said the association has gone to “great lengths” to have this report completed, and “the number one concern for people who work in any emergency service is the people in the community”.